Toyota Prius Plug-in Hybrid review | What Car? What is it? Its a Prius that you can fill from the pump, or plug into the mains. Its called a PHEV (Plug-In Electric Vehicle), a term youll need to get used to because theres an avalanche of them heading our way over the next couple of years, with the Prius at the head of the queue. The advantage over a conventional Prius is clear: by using lithium-ion batteries instead of standard Ni-Mh batteries, its all-electric mode has been extended from less than two miles to more than 14 miles, and at speeds of up to 53mph. For short distance commuters this raises the very real possibility of using the car as a pure EV almost all the time, relying on its internal combustion engine either for occasional long journeys or simple reassurance that when the battery runs down, youre not going to be stranded at the roadside. A full charge from the mains takes 1.5 hours. Whats it like to drive? Excellent in all-electric mode. Unlike a normal Prius, the Plug-in really can be used by most people most of the time as a pure electric vehicle. Thanks to the electric motors ability to provide maximum acceleration from rest, its all-electric performance is perfectly adequate in all urban and most suburban scenarios. Indeed, its so quiet and effortless youre encouraged to select its EV mode and see how far you can go, soothed by the distant thrum of the electric motor and nothing else. When you do press hard on the accelerator, or finally run out of electrical power, the firing up of the conventional engine comes as something of a rude awakening. 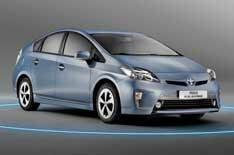 Then it behaves just like a normal Prius, with the same power and performance, the same unpleasant engine sound and, with its CVT transmission, the same poor quality mechanical refinement. Because the Prius Plug-in weighs just 50kg more than the standard car, any changes to ride and handling are imperceptible: its comfortable enough, but anyone hoping for so much as a sliver of entertainment on a decent road has knocked on the wrong door. Whats it like inside? Its a Prius, but because Toyota is going to have to charge more than 30,000 for it due to its development costs and the crippling strength of the yen its low grade interior materials seem less acceptable than ever: you can buy a BMW 5 Series for the same money. It should, however, qualify for the 5000 Government plug-in vehicle grant, but only if the pot has not run dry by the time its introduced in the summer. Impressively, the interior package is unchanged, but its still best thought of as a compact rather than truly spacious family car. A new touch-screen infotainment system should help keep your mind off the sea of cheap, pale grey plastics. Should I buy one? If you like the idea of travelling quite long distances on electric power alone, as well as all the tax and congestion charge exemptions for which it qualifies, youre off to a good start. Dont get too romanced by that headline-grabbing fuel consumption figure, though its ability to do 134.5mpg says far more about the way these numbers are calculated than the cars real-world economy. In the 2011 RAC Future Car Challenge, a pre-production model managed 94.2mpg from Brighton to London, despite being driven as frugally as possible: good, but over 40mpg shy of the claimed combined consumption. In the end its all about the numbers: will the money you save in fuel sufficiently offset the additional cost of the car? Only when the true cost of the car becomes clear next summer will it be possible to answer this.